Until the storefront's up and running, all the products herein can be used freely by your nation, your military and/or characters. The only conditions are that you use them in line with the descriptions and stats given, and that you provide some sort of IC credit somewhere in the RPs where the products feature. At the very least, something along the lines of, "Lieutenant John Doe shouldered his THR-432 Heavy Rail Rifle - one of the Colonial Defence Force's newest toys since signing the supply contract with Triplicate Defence Industries in the Ularn Interstellar Federation," would be appreciated. Also, I'd be grateful if you came back later and bought the products properly once the storefront is up and running. For over a century the leading manufacturer of high quality weapons in the Ularn Interstellar Federation, Triplicate Defence Industries offers the latest innovations in gauss and rail weapon technology. Our products range from small scale firearms for personal defence and the civilian market, right up to powerful military grade heavy weapons. For seventy years our company has also been the primary supplier of small arms for the Ularn Space Navy, and it is incredibly rare that you will ever see a USN marine without at least two Triplicate logos on their equipment. All our products are made using the latest manufacturing processes to a high-quality standard from durable and lightweight materials. We also offer weapon repair and refurbishment, produce spare parts and component kits, and offer training services. That means that when you buy weapons from Triplicate you can be assured that you are buying high quality, high performance equipment of exactly the standard necessary in modern conflicts. Our inventory is always expanding to include our latest and most advanced products, so make sure that you check back often! One final note: Triplicate Defence Industries is always looking for new ways to improve its products and services. For this reason, we are always eager to receive feedback from customers and visitors to our store about their experience with Triplicate and their purchases. Please feel free to browse our catalogue for as long as you wish. While we have tried to make finding the products you want as easy as possible, Triplicate's reputation for innovation means that some products are difficult to properly categorise. For example, the THR-432 Heavy Rail Rifle is an assault rifle in the hands of a power armoured USN marine but a heavy machine gun where issued to an unassisted infantryman. Please bear this in mind while browsing. When you are ready to make a purchase, please state the number and type of units you would like to order. When calculating the total cost of your order please remember to include the 1% shipping fee subject to the exceptions below. Once your order has been sent to us you will receive a confirmation message at which point, if you have not done so already, you will be asked to transfer the funds for your payment. Once Triplicate Defence Industries has received those funds we will dispatch your order directly to you. Please be aware that all weapons are sold separate from their ammunition or accessories. This is to allow clients the option of customising weapons exactly to their standards without having to pay extra for items they may not intend to use. However, please be aware that ammunition for most of our products' is available solely from Triplicate Defence Industries and cannot be purchased anywhere else in the galaxy, although domestic production rights may be negotiated. Please take this into account when making your purchases. Click on any product heading to be directed to that section of our catalogue, or simply scroll down to browse our product database in its entirety. This discount is available to clients who make a significant purchase of two-hundred-million dollars ($200,000,000) or more, or are having their order shipped locally, i.e. within the Ularn Interstellar Federation. The discount may also be available to regular customers at our discretion. Clients who qualify for this discount will have their order shipped for free. This discount is available to clients who make a large purchase of two-billion dollars ($2,000,000,000) or more, or are part of an organisation affiliated with or allied to the Ularn Interstellar Federation. The discount may also be available to regular customers at our discretion. Clients who qualify for this discount will receive a five percent (5%) discount on their order and will have it shipped for free. Prices and products are subject to change. All purchases made subject to availability. All prices are in USN Credits (₡). Triplicate Defence Industries Plc may apply an additional charge to orders paid in a different currency. Payment for products via exchange or barter will not be accepted. Triplicate Defence Industries Plc reserves the right to refuse to deal with any prospective customer without giving reason. Triplicate Defence Industries Plc operates a minimum purchase policy. Orders of less than one-hundred (100) units of any model will not be filled. Triplicate Defence Industries Plc operates a strict delivery upon payment policy; no purchases will be shipped until payment is received. Triplicate Defence Industries Plc reserves the right to cancel the transaction of any customer who is unable to pay for their purchase in part or in full. Where payment has only been received in part, Triplicate Defence Industries Plc reserves the right to withhold refund of payment already received. Triplicate Defence Industries Plc does not take any responsibility for financial or economic hardship suffered by customers who spend recklessly. It is the responsibility of the customer to procure funds for their purchase. Triplicate Defence Industries Plc reserves the right to add to their blacklist any customers who default on their payments or otherwise breach their contracts of sale for whatever reason. Triplicate Defence Industries will have no further dealings with blacklisted customers and reserves the right to pass on their details to third party organisations, including other arms dealerships and private security firms. Triplicate Defence Industries Plc does not guarantee the safety or performance of products which have been tampered with or neglected by the operator. All customers must be over the legal age of majority in their nation when making a purchase. Triplicate Defence Industries Plc products are not toys and are not suitable for juveniles due to small parts, moving parts, and explosive parts that may choke children. Unauthorised use of Triplicate Defence Industries Plc's Intellectual property including, but not limited to, its name, logo or graphics is prohibited. Only in-character role-played orders will be accepted. See the Global Economics and Trade Help Desk and Q&A for more information. Work out the total cost of your own order and do not forget to add the 1% shipping and handling charge. Spot checks will be carried out to deter fraud. Last edited by Ularn on Fri Mar 08, 2013 4:24 pm, edited 11 times in total. Unusually for a rifle, the TBR-288 series was originally designed solely as a carbine, with the full size rifle developed much later. 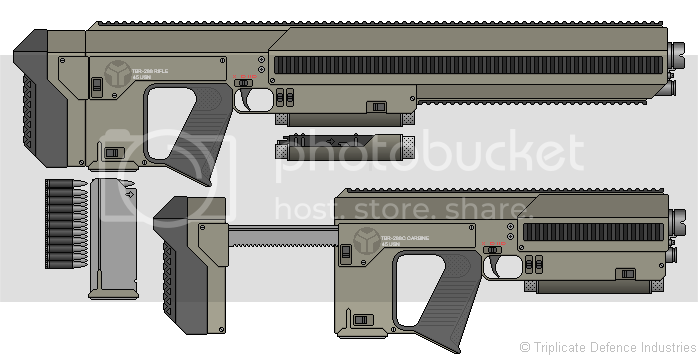 Initially commissioned for the Ularn Space Navy as a sidearm for their marines, it is possible for the TBR-288C to be wielded like a pistol by particularly strong individuals or a power armoured trooper. 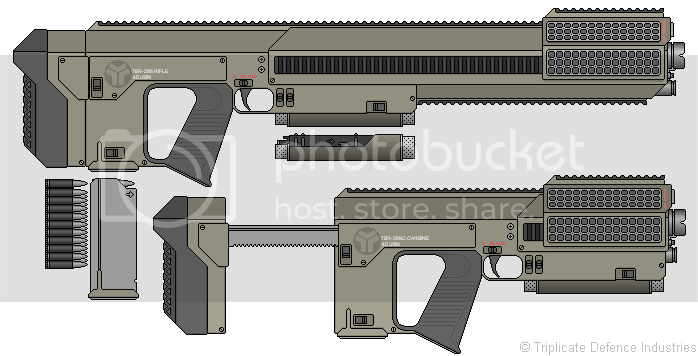 However, even in the hands of an unassisted soldier, it becomes a powerful small rifle with its .45 calibre rounds offering excellent stopping power and wounding potential while the bullpup configuration gives the TBR-288 excellent muzzle velocity and range for its size. The rails which accelerate the projectiles are manufactured from pure titanium, creating an excellent trade-off between efficiency and heat resistance. Unfortunately, this firepower comes at a price. The TBR-288 is powered by a single capacitor which must recharge between shots, limiting the TBR-288's firing rate. Nonetheless, it is a powerful and potentially devastating rifle ideal for light infantry. For those with a desire for greater firepower, the longer barrel of the battle rifle variant gives it nearly twice the range, accuracy and muzzle velocity of the carbine, albeit at the expense of battery life. Both variants share 90% of their parts for ease of maintenance, with only the barrel and foregrip differing between the two and both can be replaced within a matter of minutes. The TBR-288 features an adjustable stock, four picatinny rails and an integrated coolant system, laser sight and flashlight. The Carbine variant sacrifices its lower rail for a more compact size but retains all the other features of the battle rifle. Fire rate can be altered between semi and fully automatic and muzzle velocity can be adjusted between three programmable settings. With the flick of a switch, the operator can fire at subsonic speeds for less lethal but stealthier shooting. Each TBR-288 and TBR-288C is sold with one (1) rechargeable battery and one (1) 20 round detachable box magazine. Ammunition, accessories and additional magazines and batteries are sold separately. The prevalence of power armour among on the modern battlefield places an unarmoured soldier at a disadvantage. The rule of thumb for decades has been that the weapons best suited for penetrating power armour are the ones which can only be effectively utilised with power armour. The TNR-360 series of Needle Rifles was developed to upset this balance. While man-portable rail rifles cannot usually generate the muzzle velocities necessary for effective penetration, the Needle Rifle fires gyrojets which supplements the railgun's muzzle velocity with acceleration from the miniature ramjet built into each round. The 2.5mm wide tungsten penetrator offers excellent performance against armour, albeit with the cost of reduced wounding potential. The TNR-360 features four powered picatinny rails. Each unit comes with a cleaning kit and one 12 round magazine (empty) for 2.5mm Javelin Gyrojet ammunition. Ammunition and other accessories sold separately. Each weapon is sold as a basic unit. Ammunition and accessories are sold separately. Last edited by Ularn on Sun Apr 07, 2013 3:32 pm, edited 23 times in total. Newly adopted by the Ularn Space Navy as the standard armament of its marines, the THR-432 offers unrivalled accuracy and rate of fire for a weapon its size. Three barrels, each with titanium rails powered by separate capacitors, rotate in a gatling fashion with each barrel reloading and recharging in the time it takes for the other two barrels to fire. This increases its firing rate over equivalent single barrel rifles by a factor of three without sacrificing reliability or barrel life. The powerful .45 USN cartridge combined with an effective range comparable to some sniper rifles allows a soldier armed with the THR-432 to dominate any battlefield. If the THR-432 has one disadvantage, it is its weight. For a power armoured soldier, the weapon can be handled with the ease of an infantry rifle but for forces which place less reliance on heavy infantry it is more likely to fill the role of a general purpose machine gun. In either role it excels; a flat steel penetration of 250mm when using armour piercing rounds means this Heavy Rifle can defeat most light and medium armours available on the modern battlefield. The THR-432 features an adjustable stock and four picatinny rails. Fire rate can be altered between semi and fully automatic and muzzle velocity can be adjusted between three programmable settings. With the flick of a switch, the operator can adjust the weapon to fire at subsonic speeds for less lethal but stealthier shooting or ramp the muzzle velocity up to maximum for taking down hard targets. Essentially the same weapon in a smaller package, the THR-432C Carbine sacrifices the range and muzzle velocity of the full-size rifle for a lightweight, more compact package which makes it ideal for use in tight confines and close quarters situations. The USN issues it to commandos for its reduced weight and to marines on ship-board duty where the THR-432's length might be prohibitive. The THR-432C shares 70% parts commonality with its bigger sibling for ease of training and maintenance. The THR-432 features an adjustable stock and three picatinny rails. Fire rate can be altered between semi and fully automatic and muzzle velocity can be adjusted between three programmable settings. With the flick of a switch, the operator can adjust the weapon to fire at subsonic speeds for less lethal but stealthier shooting or ramp the muzzle velocity up to maximum for taking down hard targets. Last edited by Ularn on Sun Apr 07, 2013 3:17 pm, edited 16 times in total. The TR-12 is Triplicate Defence Industries' own variant of the Armizans Revolver, first developed on the Erasmus colony where it saw widespread use by the human colonists in their efforts to tame the planet. After acquiring Armizans Revolvers in 2344, the TR-12 has been produced in massive quantities. The TR-12 series features the same high quality finish as its counterparts from Armizans, with the only differences being automated mass-production methods in place of hand-crafting and a lighter polymer casing to replace the original steel construction. It maintains the same sturdy, reliable design and high power that made the original so popular. Rounds can be loaded either one at a time through the loading gate on the weapon's left side or all at once by swinging open the cylinder with a pull on the handle which has been stylised in the shape of the hammer which formed part of the mechanism for the revolver's chemical propellant ancestors. The TR-12 features a lightweight polymer construction, integrated ironsights and moulded rubberised pistol grip. Each weapon is sold as a basic unit. Ammunition and accessories are sold separately. Hand-crafted and customisable Armizans Revolvers remain available from the Armizans Revolvers storefront. The compact version of the Armizans Revolver, the TR-12C has a shorter muzzle for reduced weight and size, making it more easily concealed and transported. Although this reduction in size does also come with a loss in power, the TR-12C is still a devastating weapon at close ranges. The tactical version of the Armizans Revolver relinquishes its ironsights in favour of a powered upper picatinny rail. The rail allows for a massive range of accessories to be fitted to the TR-12T to suit the operator's tastes and circumstances. The rail is also powered, meaning that compatible electrical accessories can run without the use of batteries; contact points feed electricity straight to the component while others enable certain accessories, such as ballistics computers, can interface with the weapon itself. The TR-12T features a lightweight polymer construction, powered picatinny rail and moulded rubberised pistol grip. The TR-12TC features a lightweight polymer construction, powered picatinny rail and moulded rubberised pistol grip. Last edited by Ularn on Tue Mar 19, 2013 2:42 pm, edited 9 times in total. Compact yet deadly, Triplicate Defence Industries' selection of sub-machine guns are perfect for your home or personal defence needs, while also being an excellent choice for law enforcement or military uses. Designed for use without the aid of power armour or other strength-enhancing technology, the TMP-144a is a compact and lightweight sub-machine gun ideal for use as a sidearm or PDW. It's compact size makes it easy to carry and conceal and can be easily wielded without mechanical assistance. The smaller .25 USN ammunition packs an excellent punch for its size while placing a lower demand on the weapon's capacitor, allowing for a higher rate of fire than the THP-288. The TMP-144a can be fired either one-handed as a pistol or with the stock and foregrip extended for increased stability and accuracy. The TMP-144a features an adjustable stock and foregrip and three picatinny rails. Fire rate can be altered between semi and fully automatic. Last edited by Ularn on Fri Apr 06, 2012 3:22 am, edited 12 times in total. Designed as the Designated Marksman variant of the THR-432 Heavy Rail Rifle, the THR-432S sacrifices its three gatling barrels in exchange for a single pair of ultra-powerful rails for unmatchable range and firepower. The THR-432 features an adjustable stock and four picatinny rails. Muzzle velocity can be adjusted between three programmable settings. With the flick of a switch, the operator can adjust the weapon to fire at subsonic speeds for less lethal but stealthier shooting or ramp the muzzle velocity up to maximum for taking down hard targets. Last edited by Ularn on Sun Apr 07, 2013 3:14 pm, edited 12 times in total. The TAC-504 is a truly massive weapon. Designed in parallel with the Heinlein II powered armour suit for the Ularn Space Navy, its weight is such that it cannot be lifted even with conventional power armour and the recoil would kill an unarmoured being. However, in the hands of power armour strong enough to use it, the TAC-504 will be one of the most devastating weapons ever to appear on the battlefield. The .60 USN round, available in armour piercing, HEDP and various other configurations, will obliterate targets when fired at the 3km/s muzzle velocity the autocannon can obtain. At the same time, individual specialist rounds can be loaded as necessary through the access port in the receiver, which also allows for maintenance. But the key feature of the TAC-504 is its integrated under-barrel missile launcher. Capable of firing any compatible missile, grenade or another munition, it turns the weapon from a merely powerful autocannon into a versatile dealer of destruction. More than this, the control-stick pistol grip enables operators of the TAC-504 to steer guided munitions to their targets via remote control free of countermeasures. In addition to the powered upper rail providing an option for attaching scopes or other sights, the TAC-504 also features a built-in gun cam sight which can be viewed through the eyepiece below the upper rail or interfaced with any compatible Heads-Up Display. Each weapon is sold as a basic unit with a single 144 round helical magazine and Type-1 rechargeable battery pack. Ammunition, spare magazines and other accessories are sold separately. Last edited by Ularn on Fri Mar 08, 2013 4:05 pm, edited 9 times in total. While all products of Triplicate Defence Industries are supplied ready to use, sometimes you want to get a bit more bang for your buck, or accessorize your weapons for increased versatility. Radiator Panelling fitted to theTBR-288 Rail Rifle (Top) and TBR-288C Rail Carbine (Bottom). Rifles and other products not included. While the TBR-288 integrated coolant system is generally sufficient for preventing barrel warping from atmospheric firing, prolonged use in hot climates or in vacuum will cause the weapon to overheat rather quickly, reducing accuracy and service lift while increasing the likelihood of jams. This radiator panelling fits onto both rifles' RIS systems and plugs into the coolant tank via a valve at the front of the weapon above the barrel to assist with the dumping of excess heat with over 70% efficiency, allowing the operator to keep up sustained firing for much longer in any environment. TBR-288 Radiator Panelling is compatible with the TBR-288 Rail Rifle and TBR-288 Rail Carbine and should not be used with any other product. The galaxy's most advanced weapon system demands an equally advanced targeting device. Designed in parallel with the THR-432 Heavy Rail Rifle and its DMR variant, the TSR-432 Sniping Rail Rifle, the TS-432a Scope is one of the most modern and high-tech sighting devices available. Fully watertight and shielded against EMP attacks, the magnification of the telescopic sight can be varied between 2x, 6x and 12x of actual size while the red dot reflex sight above provides excellent aiming assistance at close range. With a built-in ballistics computer, the TS-432a can be easily calibrated to allow for bullet drop in almost any gravity. At the same time an infra-red vision capability provides assistance in low-lighting environments and a built in laser can be used for rangefinding, target designation or simply additional aiming assistance. In addition, combining the TS-432a with a visual display device like the TTC-432 Tactical Computer (sold separately) activates its gun camera feature, giving the operator the ability to fire around corners with accuracy while remaining largely concealed. The TS-432a Scope is compatible with all of Triplicate Defence Industries' small arms and most support weapons, as well as all other weapons supporting a compatible rail system. Last edited by Ularn on Sat Apr 07, 2012 5:14 am, edited 13 times in total. Last edited by Ularn on Mon Mar 19, 2012 8:54 am, edited 1 time in total. Last edited by Ularn on Fri Mar 23, 2012 2:53 am, edited 1 time in total. Triplicate Defence Industries recognises that it is not simply enough to own a high quality firearm without also possessing the skill to operate it. For this reason, we also offer training sessions to help customers familiarise themselves with their purchases. All of hour instructors have been trained and employed by some of the galaxy's most well known military and private security organisations and will come to you in order to provide classes ranging from simple maintenance of a single Triplicate product in front of a dozen customers, all the way up to week long training seminars with a variety of products and a class of hundreds. If a session with Triplicate's Training Services sounds like what you need, get in touch to schedule a visit. Prices are negotiable based on the nature of the training service, including class size, time, number of products being demonstrated and travelling costs. Instructors will bring their own equipment but customers are expected to provide equipment for their own personnel. Last edited by Ularn on Fri Mar 08, 2013 4:22 pm, edited 3 times in total. Last edited by Ularn on Fri Mar 08, 2013 4:08 pm, edited 1 time in total. Last edited by Ularn on Fri Mar 08, 2013 4:09 pm, edited 1 time in total.